Emma Gibbs, third from left, a then-eighth grade student at Wahama Junior/Senior High School, was the county’s first winner of the 2018 County Commissioner’s Association (CCA) of West Virginia County Government Essay Contest. Others pictured during last year’s presentation, from left, are Emma’s West Virginia History teacher Catherine Hamm; CCA Executive Director Vivian Parsons; and Mason County Commissioners Sam Nibert, Tracy Doolittle, and Rick Handley. 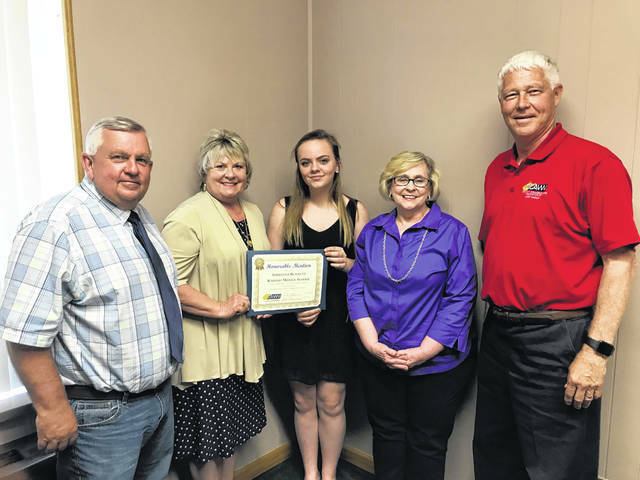 The Mason County Commission recognized Wahama student Adrionna Bennett last May for receiving honorable mention with her essay on county government from the County Commissioners Association of West Virginia (CCAWV). 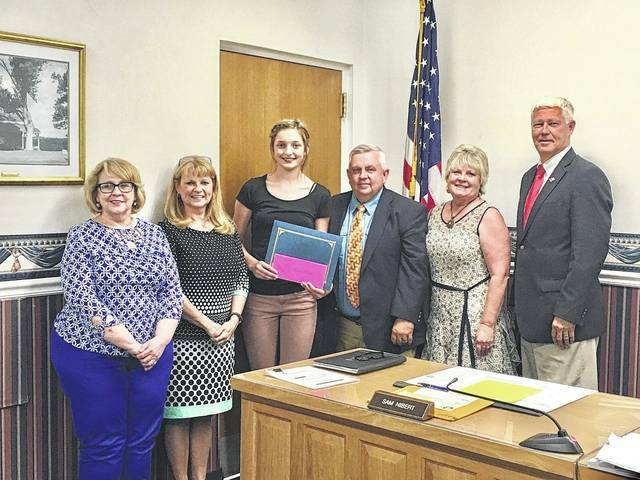 Pictured alongside Bennett, at center, during last year’s presentation are Commissioners Sam Nibert, Tracy Doolittle, Bennett’s teacher Catherine Hamm, Commissioner Rick Handley. MASON COUNTY — The Mason County Commissioners are encouraging eighth grade students within the county to participate in an annual goverment essay contest. April is National County Government Month and the County Commissioners’ Association of WV (CCAWV) will be hosting its annual essay contest for eighth grade students across West Virginia. Monetary awards will be given for first ($500), second ($300), and third ($200) place student winners. Also, a monetary award of $500 will be given to the first place winner’s teacher to be used for classroom activities. Mason County Commission President Rick Handley commented he, as well as fellow commissioners Tracy Doolittle and Sam Nibert, are open to speak with any eighth grade students and/or eighth grade classes within the county to explain what is done in their job. For the past two years two Mason County students have placed in the essay contest. Emma Gibbs, Wahama Junior/Senior High School, received second place in the state competition and was presented a certificate and check for $250 by Vivian Parsons, executive director of the CCA. in 2017. Adrionna Bennett, Wahama JR/SR High School, received honorable mention in the state competition and was presented with a certificate as well as a $50 prize by Parsons in 2018. A committee of commissioners and CCAWV staff will serve as judges of the contest. All entries must be emailed by 5 p.m. Friday, April 19 to qualify to jennifer@ccawv.org. Winners will be announced by April 29. For a list of rules or any additional information, please contact the County Commissioners’ Association of West Virginia at 304-345-4639 or jennifer@ccawv.org.